Remember yesterday when I said I was going to get up for my roommate’s 7am vinyasa flow this morning? Well, that didn’t happen. I couldn’t quite get my act together so early in the morning, especially since I would have had to leave straight from the studio to go to the hospital where I teach yoga in the Pediatric department to renew my “volunteer” status (I use quotations marks because, as I talked about in this post, I am sponsored by the wonderful Starlight Children’s Foundation). However, the wonderful thing about yoga is that it not only improves your physical flexibility on the mat, but also helps you to be flexible in your every day life. The fact that I didn’t make it to the studio was not an invitation to beat myself up over it; after all, my practiced hadn’t been sacrificed, just changed. Instead, I pressed snooze two extra times (my best friend will tell you that’s quite an improvement from college), got up, grabbed my laptop and rolled out my mat in my living room. In just a few clicks, I’d found my favorite g0-to quick practice from Yoga Today, which I actually access through YouTube: Adi’s Primary Series Express. Though I definitely prefer at least a full hour of practice, if not more, this is a really well-rounded class to do when you are pressed for time. The Primary Series Express is a shortened version of the 90-minute Primary Series of Ashtanga yoga. Ashtanga is a really powerful style of yoga that incorporates a lot of push ups and lift ups and jump throughs, of which the latter two I am still working on. In case you aren’t sure what a lift up or a jump through look like, you can see examples here and here. And no, it is not lost on me how ridiculously easy both of these yogis make it look. 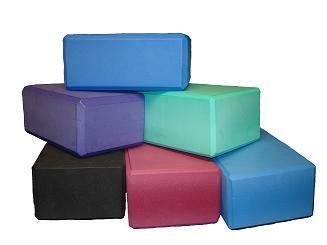 Aside from a mat, yoga blocks are probably the best investment you can make for your practice–they are extremely versatile and can bring your yoga experience to a whole new level! Oh sure, Michael Taylor, I will just bend my knees a few extra times and take a big deep breath to warm up and then I will lift myself up light as a feather. No problem. Except…that advice kind of helped me. You see, recently when I practiced my jump through (using blocks under my hands of course!) I would end up majorly stubbing a toe or falling over completely. This was strange only because I used to be able to do it (again, WITH blocks!) without much of a problem. Something was getting in my head and I wasn’t sure what it was. So today, after watching (…and scoffing) at these two videos, I gave it another go, taking some deep breaths before and voilà! My legs were through. It wasn’t pretty, but I got there, and now I can continue moving forward. Which just shows how powerful taking a deep breath and focusing on the task at hand can be; it’s something I tell Charles all the time during school, but clearly need to work on myself. What’s a pose that has been challenging to you?